A report is a display of records that meets the criteria you define in rows and columns. The report can be filtered, grouped and displayed in a graphical chart. Reports are stored in a folder, and the permission on the folder prohibits, provides read-only or read/write access to the report with "public", "hidden" or "shared" privileges. By using roles, permissions, public groups and license types, you can control access to the report folder. A dashboard is a visual display of key metrics and trends for records in your org. A dashboard component is created from a report causing 1:1 relationship between a dashboard component and a report. 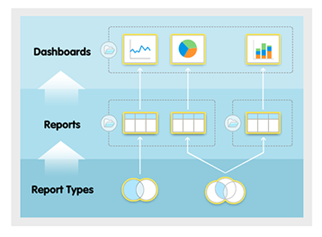 However, you can use the same report on multiple dashboard components in a single dashboard. Similar to reports, dashboards are stored in folders and control access. Since dashboard component is generated from a report, you must also have access to the underlying report to view dashboard. For each dashboard, you can define a running user, whose security settings determine which data to display in a dashboard instead of the person who is rendering the dashboard. By choosing a running user who has superior access may cause unwanted data to be shown to dashboard users, so a care should be given to limit visibility of certain data. You may configure dynamic dashboard to allow logged-in user to be the running user of a dashboard. The report type determines which fields and records are available on a report, and provides relationship between a primary object and its related objects. Reports display only records that meet the criteria defined in the report type. Salesforce provides a set of predefined standard report types, or you may create your own custom report types. The diagram above has been borrowed from Salesforce Trailhead.